This Scales of Justice Statue is a realistic replica in bronze on a round marble base. 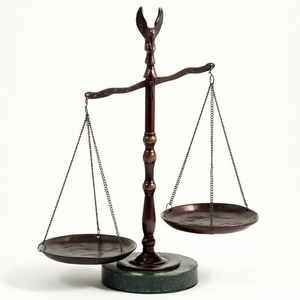 The Scales of Justice is the symbol of equal, fair justice and it has been for ages. This is symbolic and elegant law office decor and it will accent your legal office and add authority wherever it goes. A wonderful gift for a lawyer or judge, the bronze Scales of Justice statue can be displayed in the law office, judges chambers or at the county courthouse. This fine law office decoration creates an atmosphere of authority, balance and fairness. It is highly regarded and respected. The Scales of Justice statue replica can be placed anywhere in the law office or courthouse and is ideal for the legal boardroom. Order it today and enjoy this great price on a fine piece of law office decor. Dimensions: 12 1/2" H x 10 1/2" W (at top) x 4" Diameter base. Buy this fine piece of law office decor for your firm, a lawyer, judge or a client. The Scales of Justice statue replica is a high quality, scale reproduction of our nation's symbol of justice, balance and fairness. An excellent courthouse decoration and brilliant law office decor for every firm.